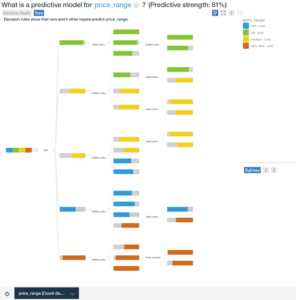 The classification predictive model was built from the mobile price classifications dataset. 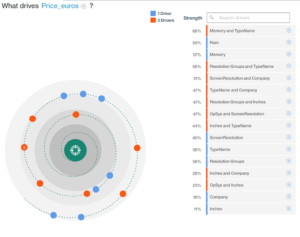 The target variable was ‘price_range’, which was reported in Watson Analytics to have a quality score of 100%. The price range variable classifications included low cost, medium cost, high cost, and very high cost. It served as the categorical target variable. 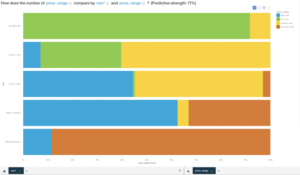 Using Watson Analytics, a predictive model was built to determine what drives price range. A spiral model showing what drives price can be seen below. 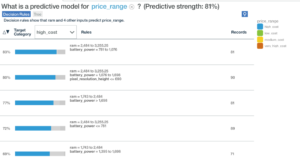 From the spiral model, it is apparent that RAM is the biggest driver of the price range. To dig into this further an analysis of how price range is impacted solely by RAM, showing a strong relationship between higher amounts of RAM resulting in price range of very high cost. Next, a decision tree was generated, which yielded a classification table shown below. 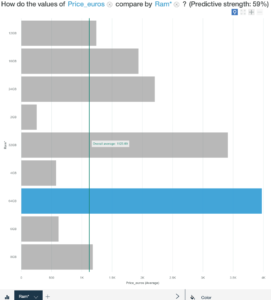 The decision tree had a predictor importance of RAM at 0.97 and battery power at 0.02. All records were included in the model. From the table, the percent of records correctly predicted were highest for very high cost and low cost, both at 90% correct. Medium cost was predicted at 81% correct, and high cost was the lowest at 63%. The decision rules for very high cost, high cost, medium and low cost were also interesting as shown in the following diagrams. For very high cost, 100% of records with RAM higher than 3,255.25 fell into this category. It is clear that the other variables of battery power, front camera, and resolution contributed to very high cost in a much smaller way. RAM was also the predominant force in for high, medium and low price ranges. The decision tree illustrates this below. 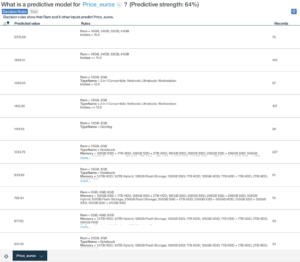 The continuous predictive model was built from the laptop price dataset. 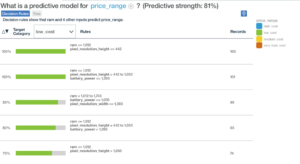 The target variable was price_euros, which was reported within Watson Analytics of having a medium quality score of 63. This variable was a continuous target variable with different prices assigned to each record. The spiral diagram, shown below demonstrates that RAM is the top single driver of price. The diagram below shows this relationship singled out into a bar chart. The predictive strength is however overall lower than the earlier classification model above at only 59%. The predictor importance table below illustrates the significant strength of RAM as a predictor compared to the other variables. The analysis drew on all records in the record set with none excluded from the model. The decision rules were also interesting as demonstrated below. 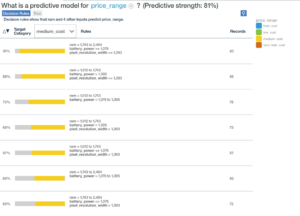 Ram was at the forefront of predicting price along with less significant variables across the various price points illustrated in the table. 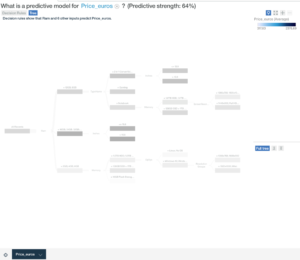 The decision tree for the price euros predictive model can be seen in below. 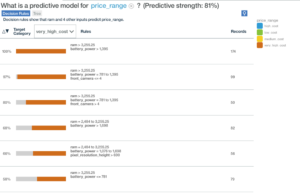 Overall this model did not give as strong an indication of drivers for price as the classification model, however it was clear that RAM was again the top driving variable. Image Credits: Photo by rawpixel on Unsplash.